The Trump administration is moving forward with plans to expand offshore drilling in U.S. waters, threatening the Atlantic, Pacific, Gulf of Mexico, and Arctic Ocean with the prospect of new oil rigs. Interior Secretary Ryan Zinke has announced the official launch of a multi-year process to revise the 5-Year Offshore Drilling Plan as directed by a recent executive order. A 45-day comment period is now open until August 17th for the public to provide initial input on the administration's plans (see below for more information on how to comment). Last year, Surfrider chapters on the East Coast played an instrumental role in reversing the Obama administration’s plans to open the Atlantic to new oil drilling. Through raising awareness about the impacts of offshore drilling and building opposition from coastal businesses and communities, Surfrider and our partners prevailed in protecting the Atlantic. Now, we must rally once again to stop new oil rigs off our coasts. A Request for Information (RFI) was published in the Federal Register with a 45-day comment period that will close on August 17th. To submit your comments visit http://www.regulations.gov and search for BOEM-2017-0050 in the search bar. The Department is seeking information and/ or suggestions from the public to assist in developing the 2019-2024 Offshore Drilling Program. Below are suggested points to include in your comments. Make sure to personalize and include specifics on how new drilling could impact your community, business, or way of life. The existing 5-year offshore oil and gas leasing program, which excludes the Atlantic, Pacific, and Arctic Oceans, is the result of years of scientific review and millions of public comments. These comments demonstrate overwhelming public opposition to new offshore drilling. Revising the 5-year program conflicts with both the federal government's scientific review and the will of the majority of Americans who want to see investments in clean energy over new offshore drilling. More than 100 House Democrats and Republicans have signed a letter urging the Department of Interior not to allow any new offshore oil and gas drilling in the Atlantic and Pacific oceans and to honor the current 5 year offshore drilling plan. 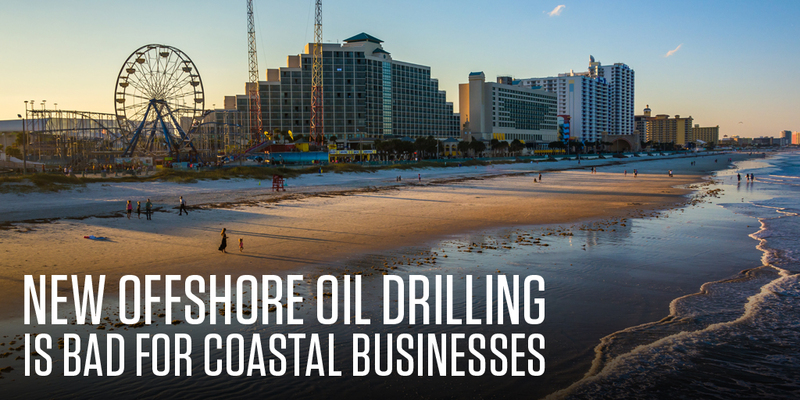 To date, over 120 East Coast municipalities, 1,200 elected officials, and an alliance representing 35,000 businesses and 500,000 fishing families have publicly opposed offshore drilling and/ or seismic airgun blasting off the Atlantic coast. New offshore oil and gas development threatens existing coastal industries such as recreation, tourism, and fishing, that rely on a clean and healthy coastal environment. The coastal recreation, tourism, and fishing sectors engage millions of Americans and generate billions of dollars for our nation's GDP. Personalize: explain how new offshore drilling could impact your community, business, or way of life. Submit comments against seismic blasting in the Atlantic to search for oil and gas click here. Submit comments in support of California's National Marine Sanctuaries and against offshore drilling in the Pacific learn more.